Product prices and availability are accurate as of 2019-04-22 19:17:55 UTC and are subject to change. Any price and availability information displayed on http://www.amazon.com/ at the time of purchase will apply to the purchase of this product. Jeremy Crawford has had enough of his life as a megawealthy banker and is prepared to give up all its privileges for the sake of freedom. The trigger of this drastic change of heart? The realization that, since childhood, he has made no choices of his own and only ever been chosen. An entertaining Kafka-esque fantasy. Pragmatic Jeremy Crawford is successful, wealthy and has everything laid at his feet. A genius in his work and force to be reckoned with, until the day he suddenly wakes up with a jolt. He recognizes the ephemeral life he's had over the years. Meaningless and all given to him. Not chosen. Questioning himself and his actions, Jeremy withdraws from the outside world and engages with philosophical conversations with a pig named Pete. This is a very funny and cleverly-written book. The writing is fantastic. The dialogues just blew me away and I loved the way Paddy Bostock describes things. He's an author that anybody could easily love. If you're an adult or a teen, you would definitely enjoy this book. It's out of the ordinary, charming and extremely witty. 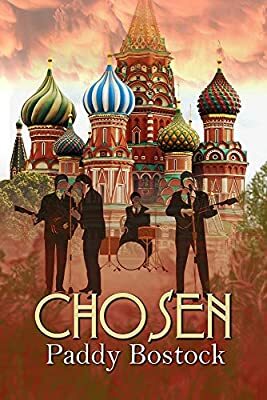 After reading The Hanging by Paddy Bostock, I was thrilled when I got the ARC for Chosen. I like the unique style of Paddy where you not only have a good storyline and character-building, the writing style itself is very enticing. The story revolves around the MC Jeremy who suddenly realises he's never Chosen anything in his life so far. He has conversations with his pet pig Pete about how his life is ... one-sided of course! What he does and how he takes charge of his life…or does he is the rest of the story. I absolutely loved Jeremy. This is a wonderful change from hard and arrogant MC that seems to be a common troupe with Romance novels. Also, I loved Julie and she's an ideal match for Jeremy. Want to know what happened and how? You've got to read the book, of course! In this wonderful political fantasy, Paddy Bostock is back with a book that is unforgettable and mesmerizing. It is a book that I couldn’t put down once I started reading it. It is a story that most of us can relate to. We all get bored with our lives, regardless of what profession we are in. And sometimes, we feel that we have to make fairly big changes just to have a little bit of bliss and freedom. Jeremy Crawford wants to live a life he chooses and not one that is handed on by others. Jeremy Crawford seems to have it all. He has a great life as a very wealthy banker. But he feels that something is missing in his life. He no longer wants to continue as he has for many years, living someone else’s life. He wants to live a life than isn’t mediocre and dull. He wants to be able to do other things of his own choosing. It’s hard to believe Jeremy would want to pursue something as different as politics. But he does. Much like our world, the world that Bostock has created in his book is just as out of control as ours is currently. But how can Jeremy resolve his need for freedom and autonomy through the world of politics? It seems that these goals do not cohere with each other, until we read Bostock’s story.